WASHINGTON | President Donald Trump likes to describe the state of the union as he wants it to be, not how it really is. 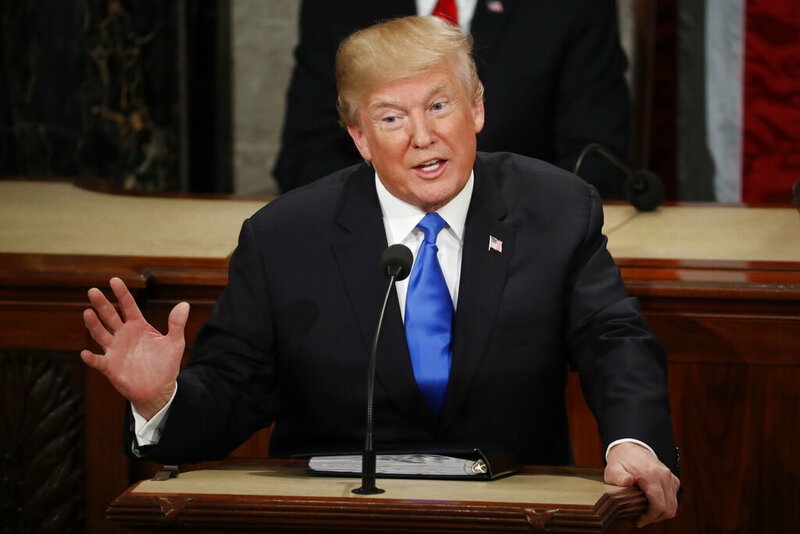 The State of the Union address, though, is a different species than most political rhetoric and a whole different animal than Trump’s visceral tweets. It’s carefully prepared, thematic in nature and light on raw, “lock-her-up” partisanship. Those touchstones are likely to be reflected in Trump’s speech to Congress on Tuesday night. Still, Trump’s State of the Union speech a year ago wandered from reality. He inaccurately described his tax cuts as the largest ever (they were perhaps the eighth largest) and hailed rising wages “finally” even though they rose more under President Barack Obama in 2016. He wrongly described the visa lottery program as one that “randomly hands out green cards without any regard to skill, merit or the safety of our people,” when it actually requires education or experience and extensive background checks. In Trump’s eyes, his national security achievements are on a grand scale, almost certainly “the biggest,” ”historic” or involving enemies wholly “defeated.” Even when they’re really not. Just days before his speech to Congress, U.S. intelligence chiefs flatly contradicted their boss on what’s going on in North Korea, Syria and Iran, deflating a story he surely wants to tell the nation Tuesday. They said North Korea is not likely to give up nuclear weapons and the Islamic State remains dangerous, while Iran has respected the terms of the nuclear deal it struck with world powers. That pushes back against Trump’s more benign view of North Korea as a state ready to deal on denuclearization, against his declarations of victory against IS, and against his depiction of the Iran nuclear deal as a sop to Tehran. It is true that North Korea has not conducted nuclear or missile tests since Trump’s genuinely historic meeting with leader Kim Jong-Un in June. But the North has continued to develop both nuclear and missile technology, according to reports from private analysts and think tanks. More notably, the two sides are still far apart on what denuclearization means and have been unable to agree on next steps. Although a second summit has been agreed upon, no date or venue has been announced. More broadly, any president’s dream is to stand before the nation and speak of troops coming home in victory. The facts are getting in the way of that for Trump. In a Dec. 19 tweet, Trump announced the withdrawal of U.S. troops from Syria, saying they would begin leaving “now.” Over the past month, however, Trump and others have appeared to adjust the timeline, and U.S. officials have suggested it will probably take several months to withdraw forces. The Pentagon, the CIA and others in the national security structure say IS remains a lethal threat despite its territorial losses. Trump likes to say there’s a crisis involving illegal immigration and only a wall can fix it. Drugs, criminals and terrorists are pouring into the country without one, he declares — and claims Democrats oppose border security. His claims that people in the country illegally are a special menace to public safety is at odds with plentiful research. Multiple studies have found that people in the U.S. illegally are less likely to commit crime than U.S. citizens. A wall also can’t do much about drugs, when trafficking is concentrated at land ports of entry, not remote stretches of the border that could be walled off. Few would argue that a humanitarian crisis is unfolding, as the demand for entry by migrants and the Trump administration’s hardline response to them are overwhelming border resources. But a national security crisis? Trump has exaggerated the problem by repeatedly promoting the discredited notion that terrorism suspects are pouring into the U.S. from Mexico by the thousands. Regarding Democrats, it wouldn’t be accurate to say, as Trump did in his Jan. 8 primetime TV address, that they “will not fund border security.” They just won’t fund it the way he wants, refusing his demand for $5.7 billion to build part of a steel wall along the U.S.-Mexico border. Democrats passed legislation the day they took control of the House that offered $1.3 billion for border security, including physical barriers and technology along the southern border. Senate Democrats have approved similar funding year after year. In recent weeks, Democrats in both chambers have offered plans to provide billions of new dollars for border security measures other than a wall. It’s his common retort when asked about the prospect of impeachment launched by Democrats over his legal controversies: Look at the economy and jobs market. Actually, the economy is healthy but not one of the best in history. Also, there are signs it is weakening after a spurt of growth last year. On jobs, Trump frequently points to a jobs market that is shattering records, including unemployment for African-Americans. He’s overstating it in many cases and taking undue credit. It’s true that more people are working now, but that is because of population growth. A more relevant measure is the proportion of Americans with jobs, and that is still far below record highs. According to Labor Department data, 60.7 percent of people in the United States 16 years and older were working in December. That’s below the all-time high of 64.7 percent in April 2000, though higher than the 59.9 percent when Trump was inaugurated in January 2017. Black unemployment did reach a record low, 5.9 percent, in May. But that figure is volatile on a monthly basis. That rate has since edged up to 6.8 percent in January, possibly in part because of the government shutdown, which elevated unemployment last month. That’s still nearly double the jobless rate for whites, at 3.5 percent. Meanwhile, the median income last year for an African-American household was $40,258, according to the Census Bureau. That’s below a 2000 peak of $42,348. And there are multiple signs that the racial wealth gap is worsening. What a difference a year makes. From predicting that the Affordable Care Act would “implode” and “explode,” Trump now regularly claims credit for stable premiums under the health law. He’s likely to keep repeating it, even though he’s wrong. Actually, in his first year in office, Trump tried unsuccessfully to repeal the health law, then rescinded a major insurer subsidy, triggering a wave of premium increases. Experts say the main reason for the flip in Obamacare’s fortunes is that the premium increases of previous years allowed insurers to return to profitability. About 9 in 10 Obamacare customers receive subsidies that are designed to increase with the rising cost of insurance, protecting them from price jumps. Those taxpayer-backed subsidies allowed the insurers to stanch their earlier losses. Trump also likes to point to his administration’s new health insurance options. Short-term plans and association plans offer lower premiums than Affordable Care Act plans but they don’t have to provide the same comprehensive benefits. Short-term plans don’t have to cover pre-existing conditions. The availability of lower-cost options is not going to “drive down” prices for ACA plans but may actually increase premiums for robust coverage if fewer healthy people take it as a result. Expect the president to acknowledge the service of troops and veterans. He often overstates what he’s done for them. One of his oft-repeated claims is that he gave U.S. troops “the first” or “the biggest” pay raise in a decade. In fact, U.S. military members have gotten a pay raise every year for decades. As well, several in the last 10 years have been larger than service members are getting now — 2.4 percent this year and 2.6 percent in 2019. Raises in 2008, 2009 and 2010, for example, were all 3.4 percent or more. As well, he talks about being the first president in “decades” to get Congress to approve the Veterans Choice private-sector health program, when he isn’t. Obama was the first, following a 2014 scandal at the Phoenix Veterans Affairs medical center. Trump often says that veterans will now get more “choice” in selecting outside physicians if they endure long waits for VA doctors, pledging enough money to give veterans the care they need. That remains highly questionable. The VA has yet to resolve long-term financing due to congressional budget caps after the White House opposed new money to pay for the program, saying it would be fiscally unwise. As a result, lawmakers could be forced later this year to slash core VA or other domestic programs. Associated Press writers Christopher Rugaber, Colleen Long, Jill Colvin, Robert Burns, Matthew Lee and Ricardo Alonso-Zaldivar in Washington and Elliot Spagat in San Diego contributed to this report.